(1) UPTE Everywhere! Tag Yourself. Our “sticker up and post it” days of action at all UC campuses last week went off with tremendous participation and fun. We sent a strong message to UC as a large group of UPTE members marched into bargaining at UCLA to present 2,500 bargaining petitions. Check out the UPTE Facebook page for lots of great photos. You can find the day’s pictures by searching the internet using the hashtag #UPTEStrong. Spread the buzz by taking a picture of yourself and/or your coworkers, and post it using the hashtag #UPTEstrong. Share to Facebook, Twitter, Instagram or other social media. You can also see and share the news coverage of the action by going to the Labor’s Edge blog and Workers Independent News (audio at lower right). Together, we can make a difference for our quality jobs and quality research, education, health care. First, stop the inhumane gutting of the Affordable Care Act and Medicaid. Republican senators have released their health care plan developed in secret. The plan will take health insurance from millions and those who remain insured will have less coverage that is more costly. 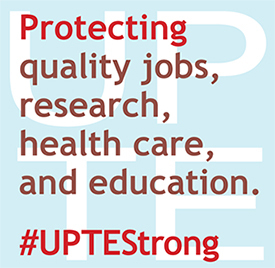 This is a matter of life and death for so many, including many UPTE members and our families. What can you do? Call your senator through this hotline and tell them to vote down any repeal of the Affordable Care Act: 1-855-764-1010. Call now because a vote is imminent. Second, support health care for all in California. Assembly Speaker Anthony Rendon has threatened to sideline consideration of the health care for all bill (SB 562) that passed the state Senate. This bill will provide everyone health care with huge overall savings because insurance company and excessive pharmaceutical profits would be eliminated. Everyone will have a choice of which medical provider they want to use. On this issue also, do not delay. Legislative action may come quickly so don’t wait.